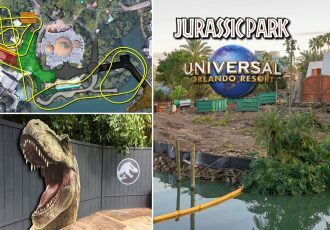 Some of the themed areas are wrapping up since our last construction update for the new coaster being built at Universal’s Islands of Adventure, (which still doesn’t have an official name yet). 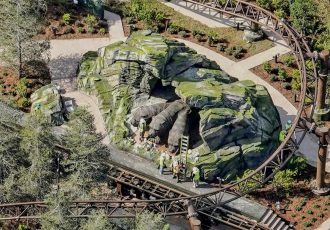 Recently we discovered coaster trains on the track that all but confirm the ride vehicles will look like Hagrid’s motorbike. 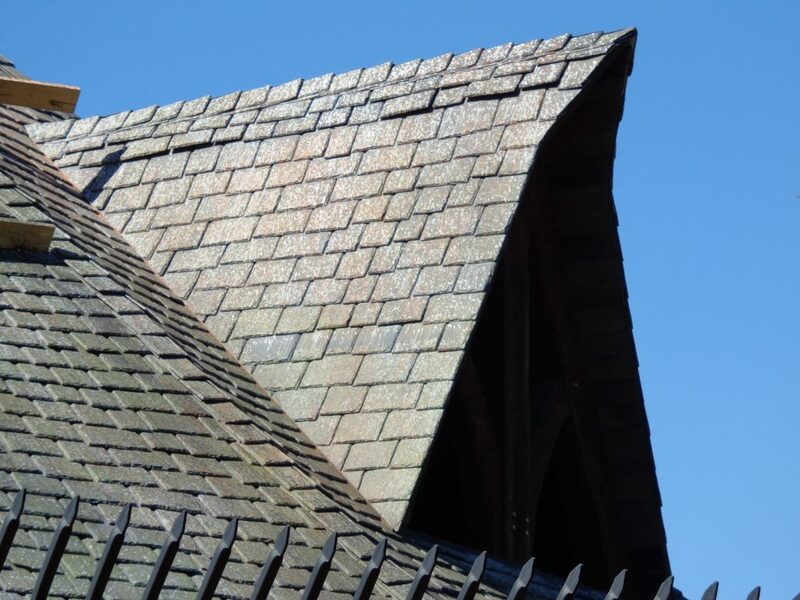 See our recent article for more information about that. 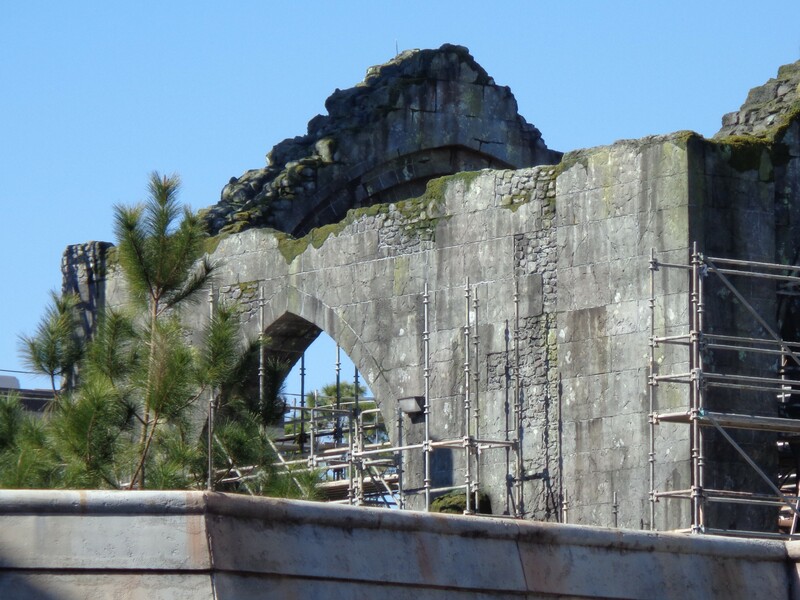 The ruins, the mysterious structure that track passes through multiple times on the ride, is finally starting to see scaffolding come down. 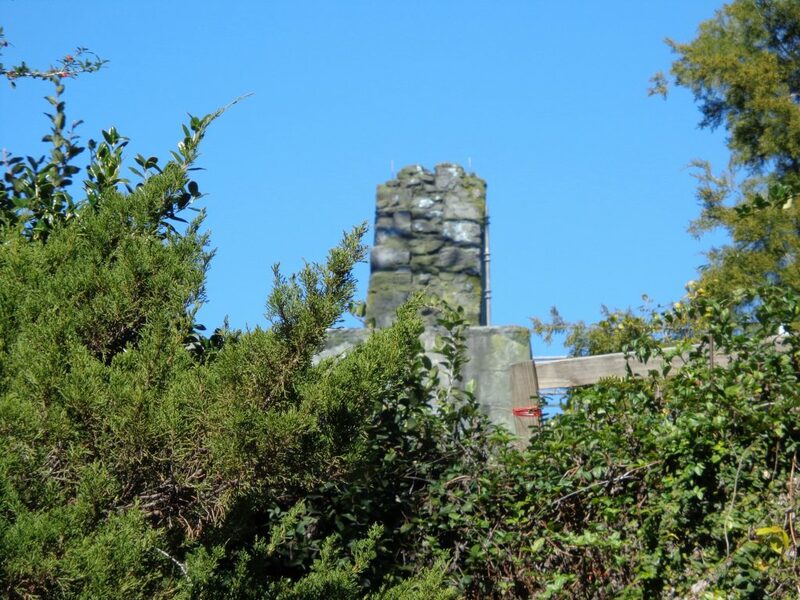 The brickwork has been beautifully painted with touches of green to help it appear aged and covered in moss. 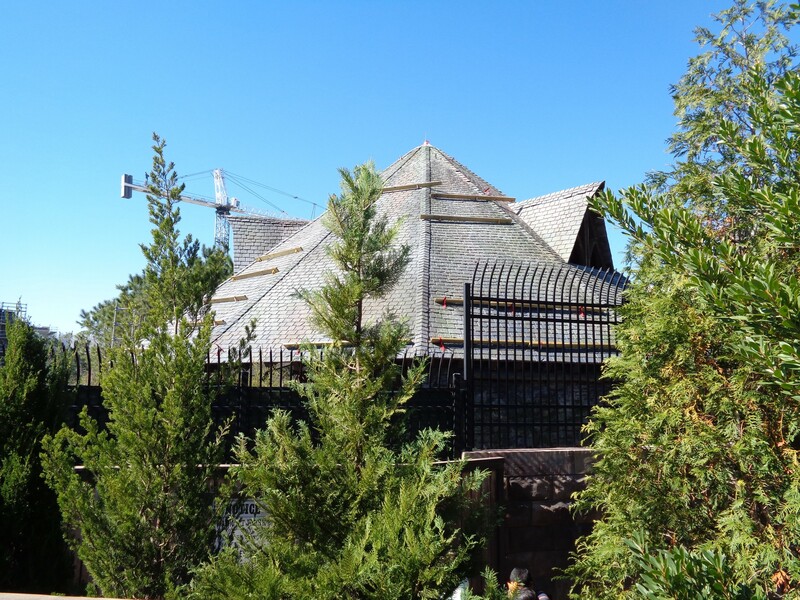 The round structure has received brickwork walls and a fake slate shingle roof, which is also seeing new paint to make it appear weathered. Check out the complete photo report, as well as a scene by scene track layout image below for more information. 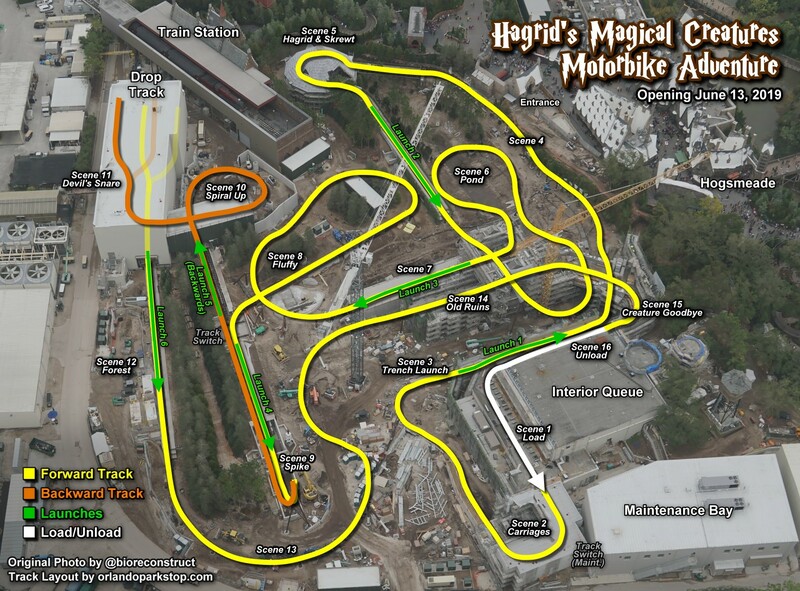 We’re starting today’s update with another updated track layout graphic, (click on image for a larger size). 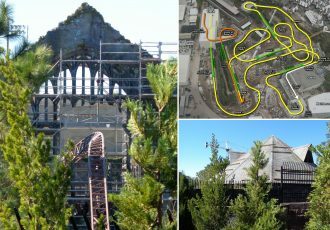 Included in the image are labels for launches (in green), as well as every scene on the ride. Regular forward-facing track is shown in yellow. 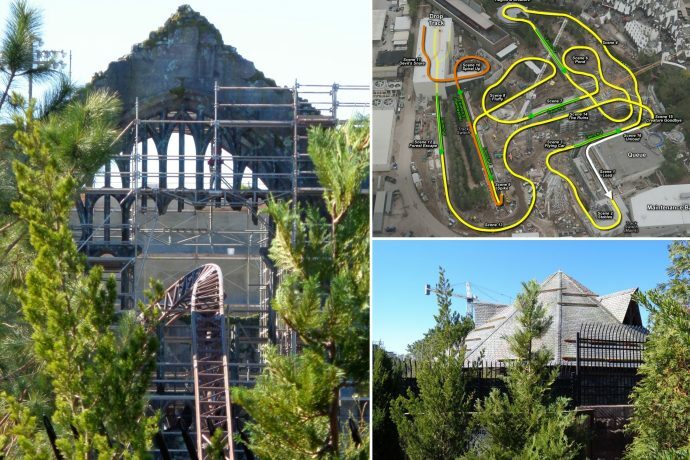 The orange track is for backwards motion, and after the drop track it resumes going forward in yellow until the end. The original aerial photo was provided by @bioreconstruct on Twitter. 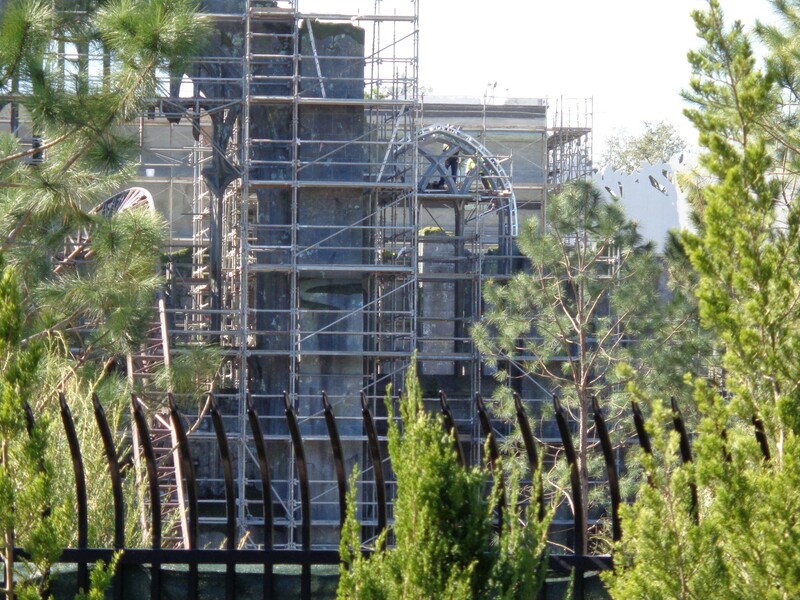 The ride is said to contains 16 scenes in total, including the load and unload platforms. 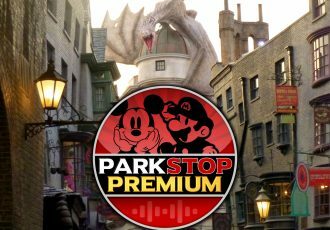 (This does not include the queue itself, which will also contain detailed sets and scenes of its own, but we’ll cover that in a future update.) There are six launches throughout the attraction, but only two complete stops. One stop is inside the round structure, where Hagrid will be showing off a Blast-Ended Skrewt. The other full stop is right before the track drops in scene 11. Scene 11 will have us trapped in the Devil’s Snare before we are released, and fall straight down. 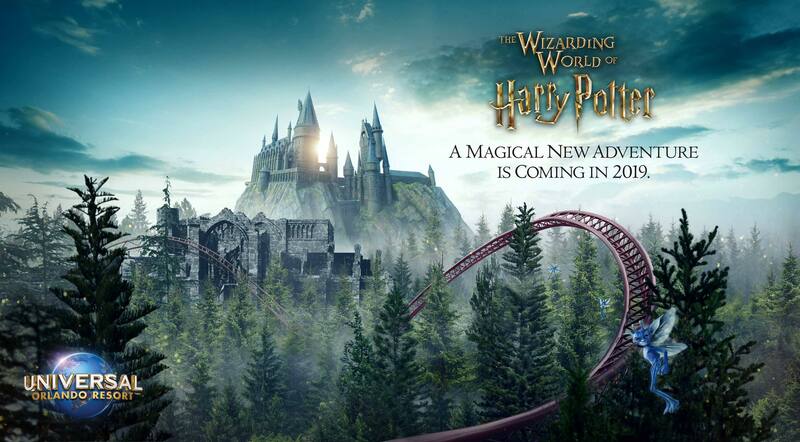 I want to stress that there will be no screen elements throughout this ride, which is a dramatic departure from all of the previous rides in The Wizarding World of Harry Potter, with the exception of Flight of the Hippogriff. 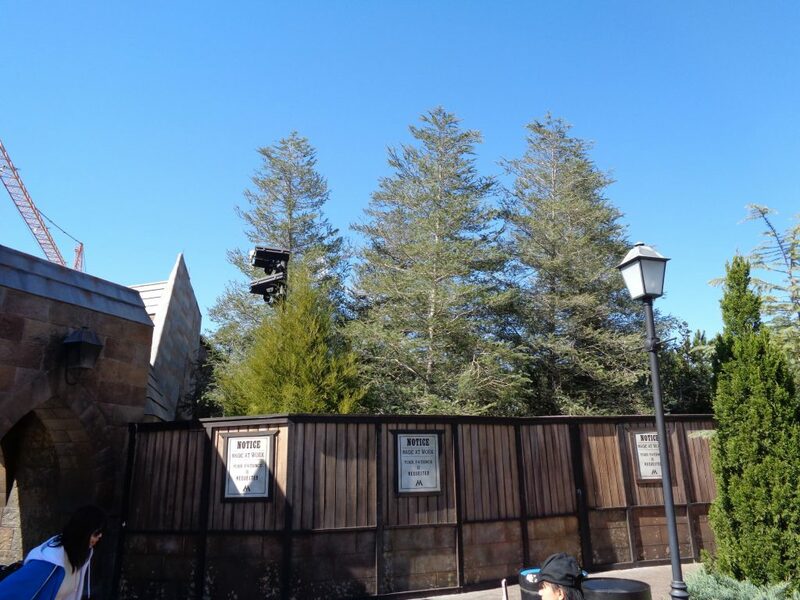 Curiously, just like this new attraction, Flight of the Hippogriff also stars Hagrid (although in voice only). 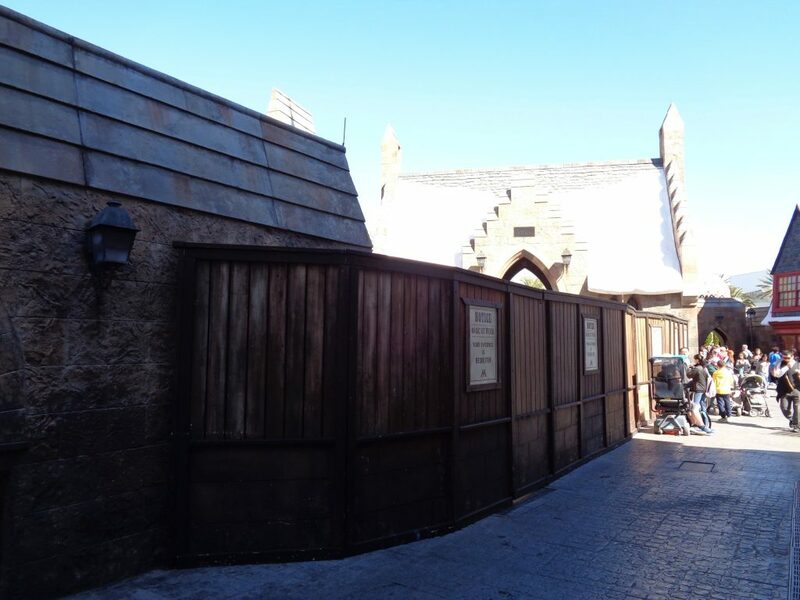 Other notable scenes on this new ride include scene 3, which will feature the Weasley’s flying Ford Anglia. The car will meander towards us as we pass it on the right. The only released artwork for the ride features a Cornish Pixie. 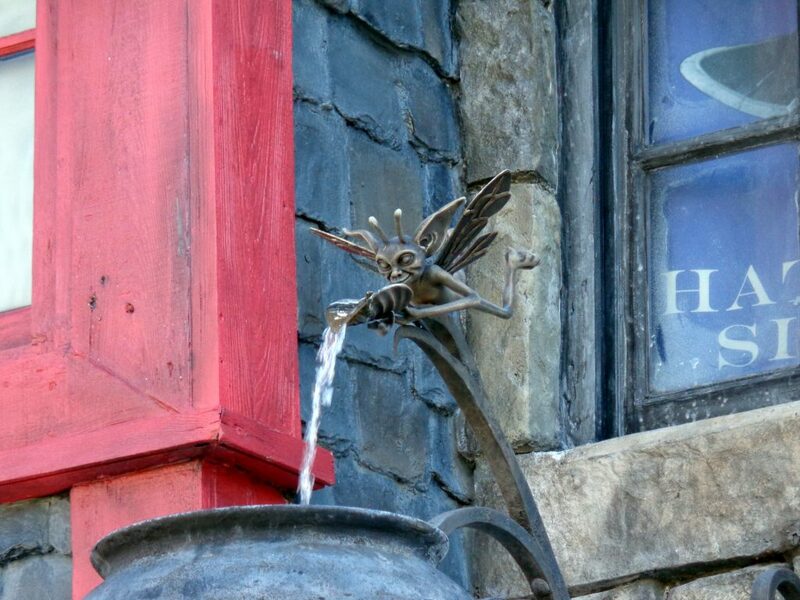 One of the rumors I have heard has a swarm of Pixies attacking the flying car as we pass. I have yet to confirm this report, however it certainly seems possible. 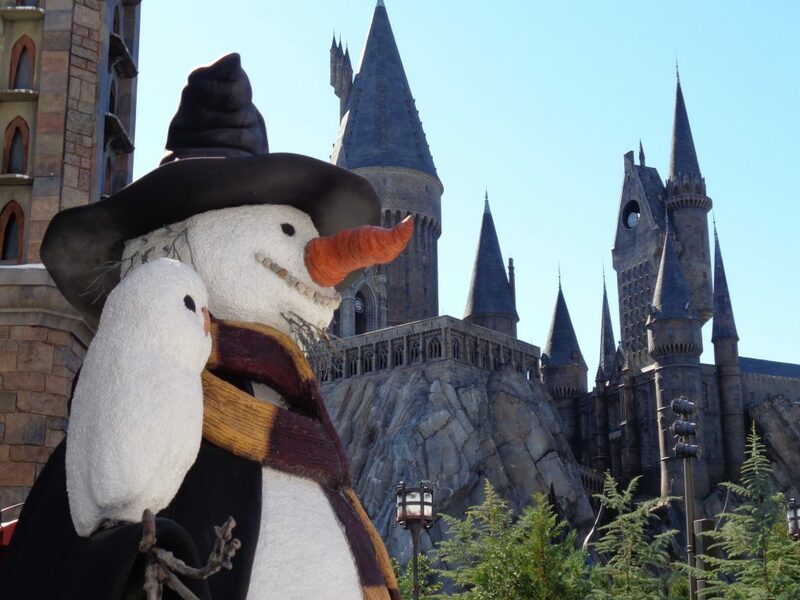 Another stand-out scene is number 8, which is said to include the three-headed dog, “Fluffy.” This full-size animatronic figure will move its heads towards your coaster train as you pass, snarling while seated under a rock formation. The final scene before unload will include another creature figure, most likely the same Blast-Ended Skrewt we encountered earlier. 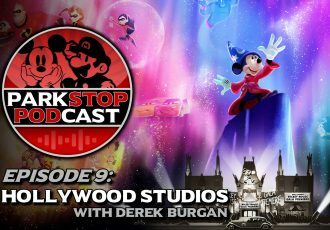 We’re still unsure of what will be found in scene 2, the first scene after load, but it looks like the setting may be some sort of stable. For a play by play of what the coaster experience may be like, check out my original video explaining the ride here. 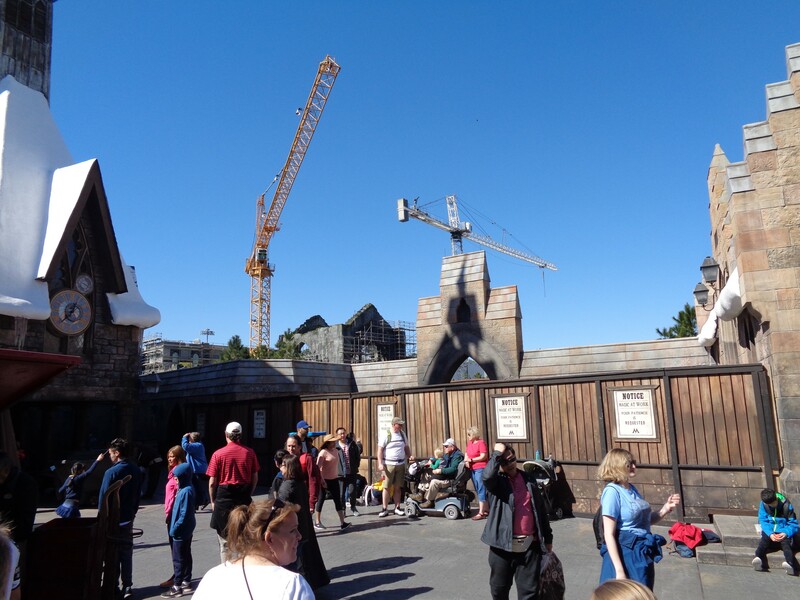 Now that we’ve got an idea of what the ride will be like, let’s take a look at today’s construction update. 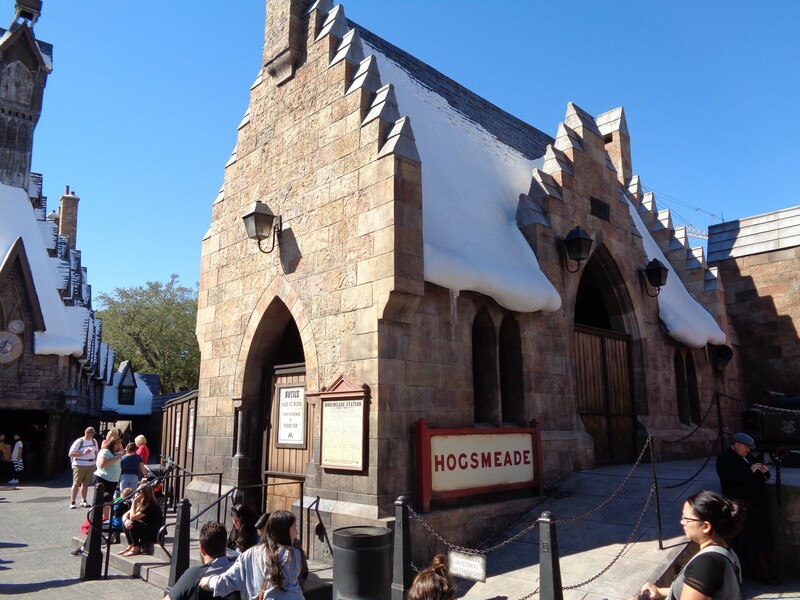 Our first stop is the train station at Hogsmeade Village. 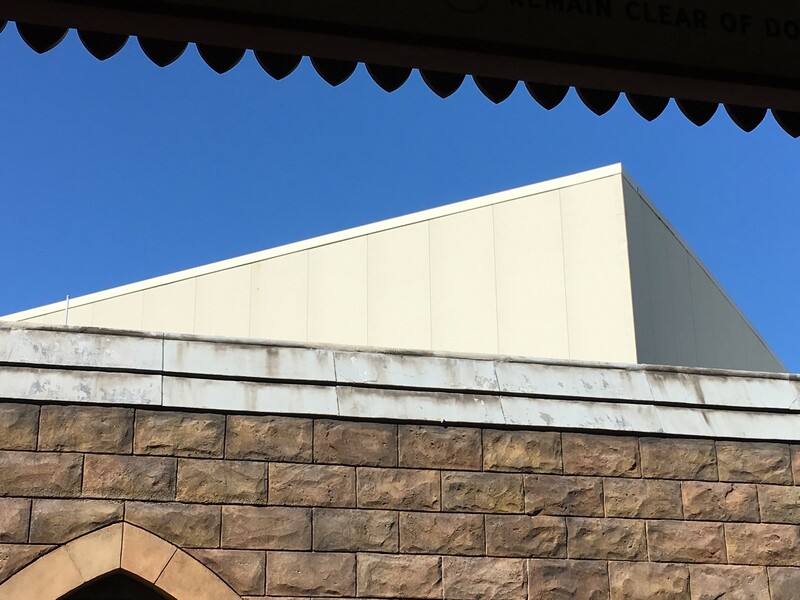 Visitors getting off the train or waiting to board may catch a glimpse of the large drop-track building for scene 11, poking up above the station wall. 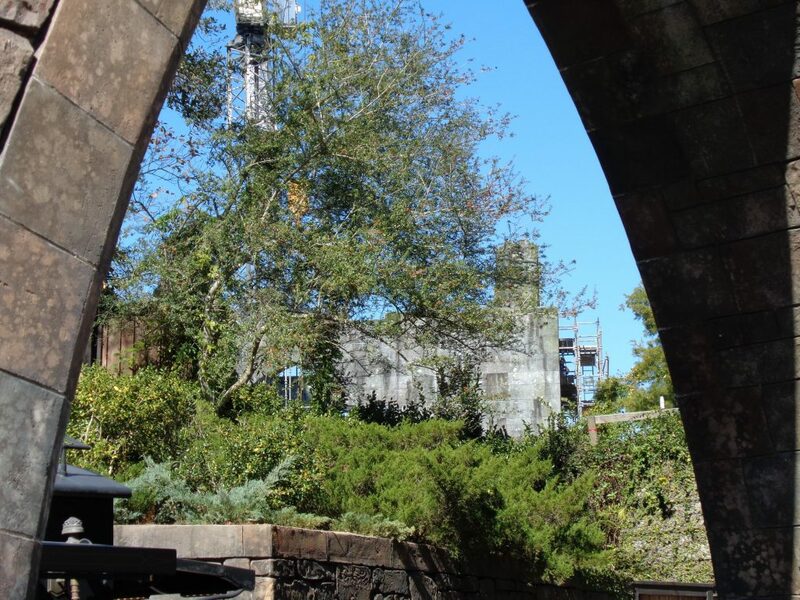 After exiting the station, and heading towards Hogsmeade, we’re offered a great view of the round structure from the ride. This is where scene 5 takes place. In this scene Hagrid is showing off his Blast-Ended Skrewt, but be careful, they shoot fire! 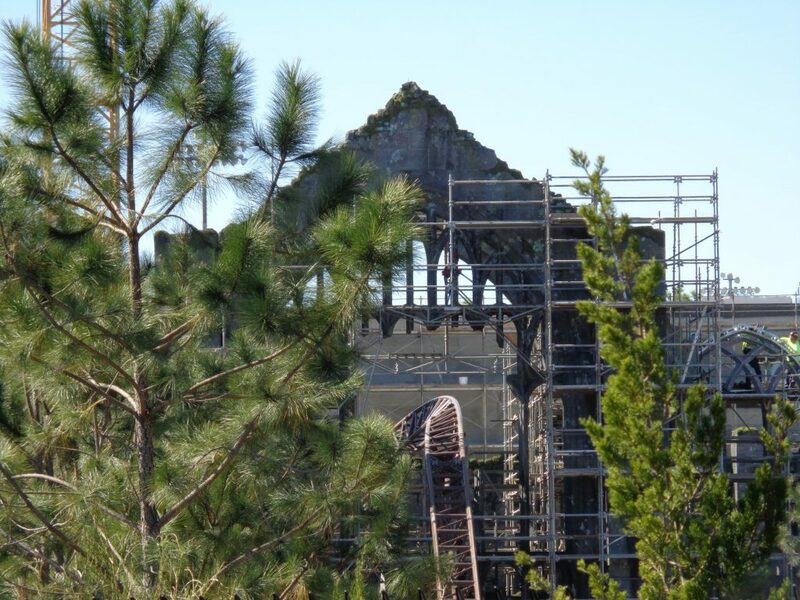 We can see a burned out hole in this round building, where our trains will exit and then be shot out in the second launch. 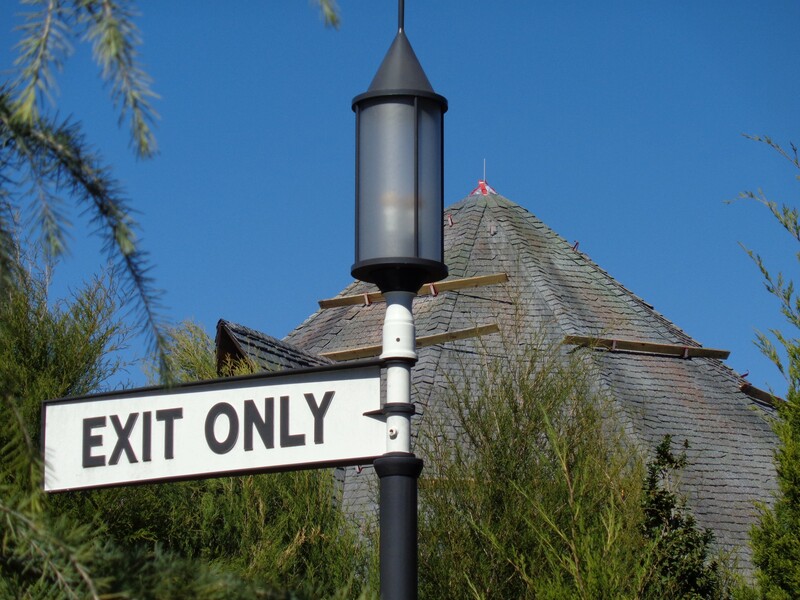 There appears to be a strip of LED effects embedded in this exit hole as well. 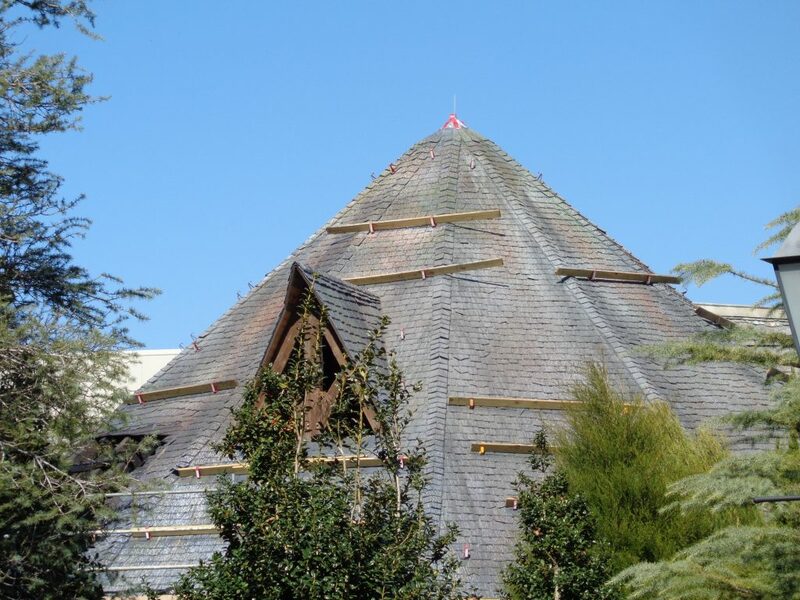 We’ll get an even closer look at this structure later from another vantage, but let’s take one last look before moving on. 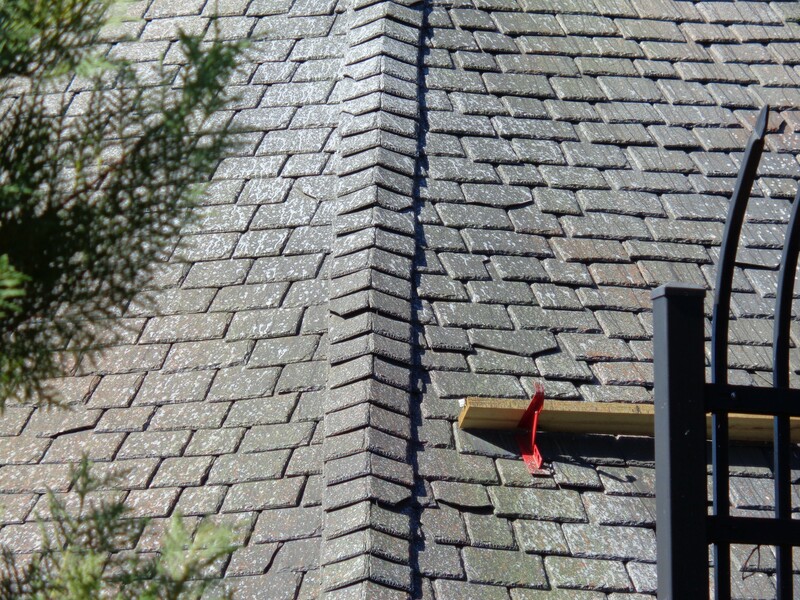 You can see the aged paint on the roof from here. 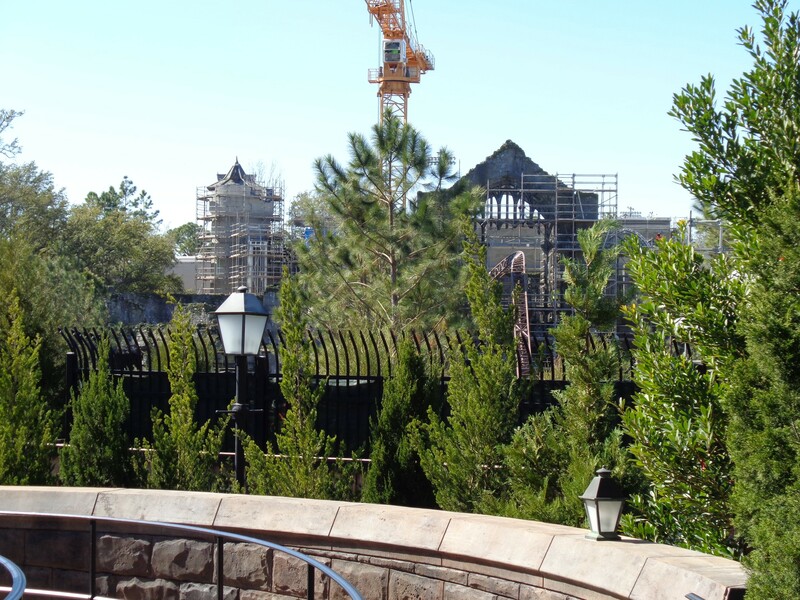 Lots of trees have been planted. Unfortunately, they block our view of the coaster from here. 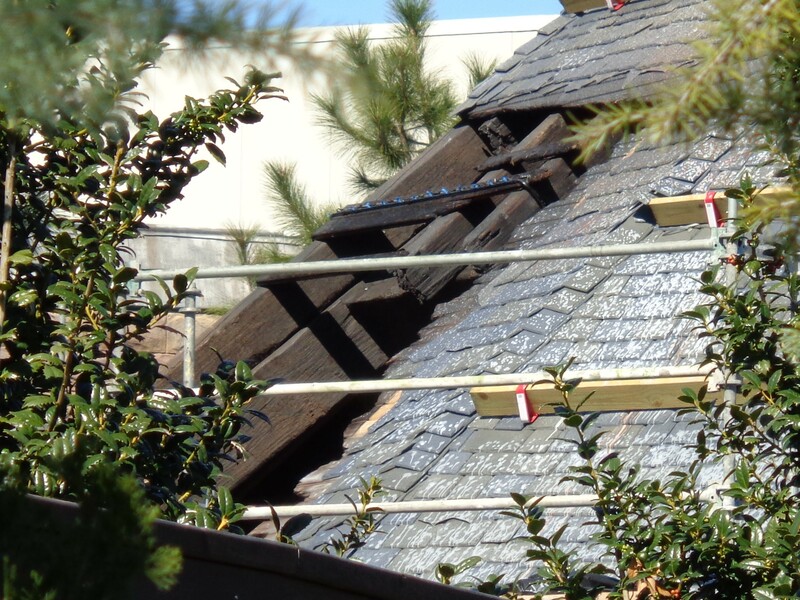 Fortunately, they will add a lot of character to this attraction. 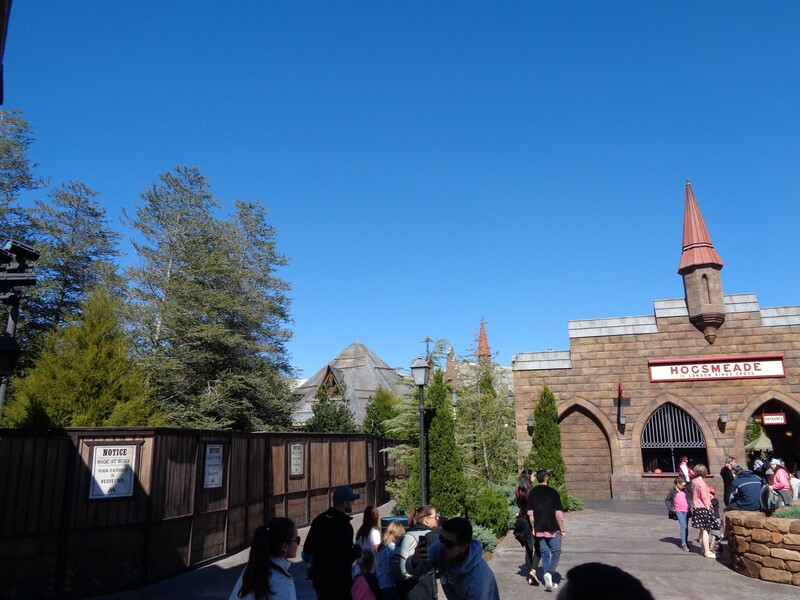 Inside of Hogmseade, we can see work walls still up around the former Dragon Challenge entrance and free locker rental areas. 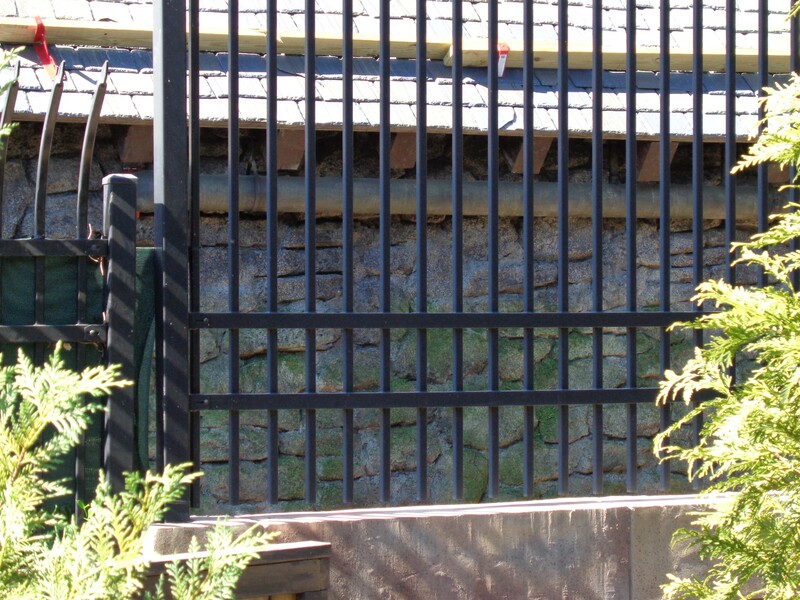 The new coaster’s entrance is rumored to remain in this area, but will be themed differently. 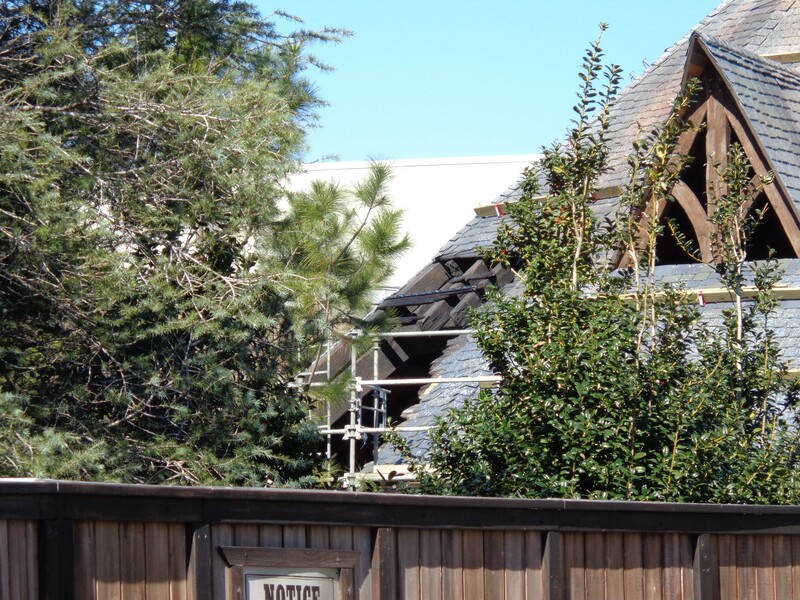 If you stand far enough back, all the way by the Three Broomsticks, you can catch some glimpses of track and themed elements of the ride through that old entrance arch. 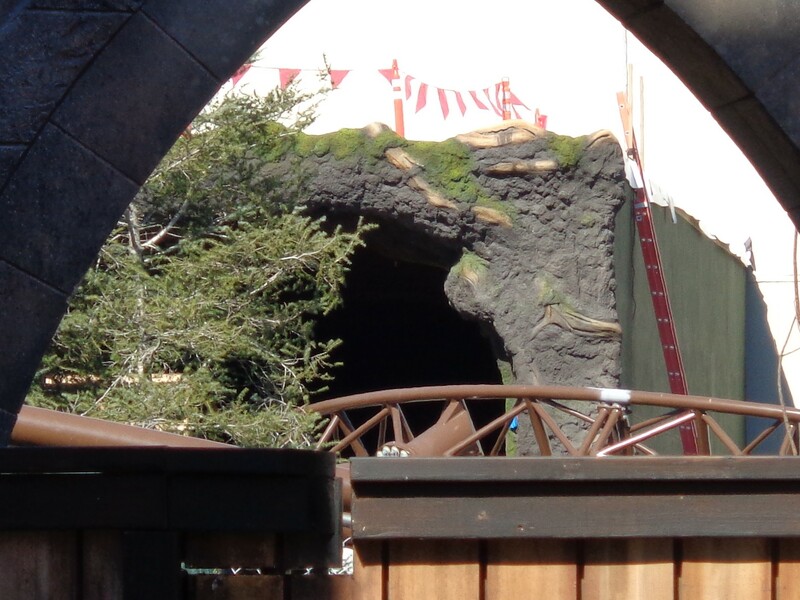 One of the things visible is the cave-like entrance to scene 11’s devil’s snare building. 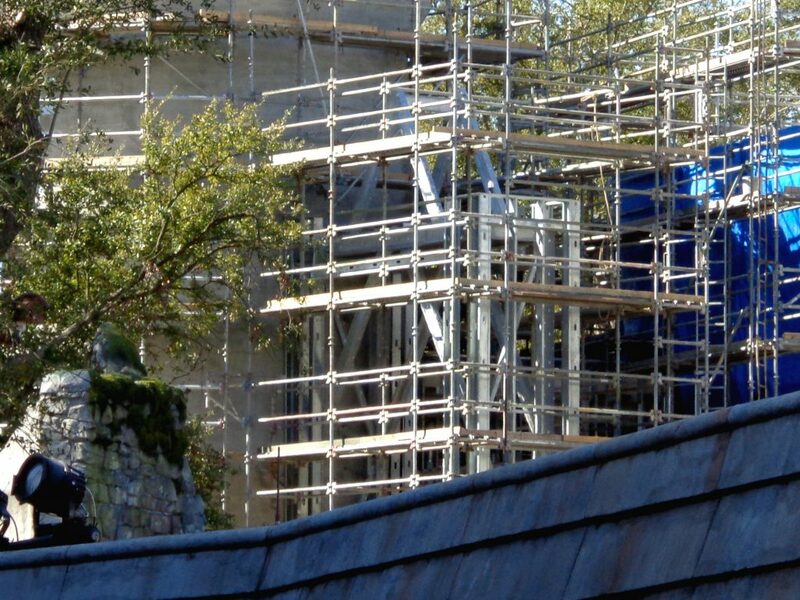 Also from the front of the ride entrance we can get a view of some of the work happening near the queue building entrance area. 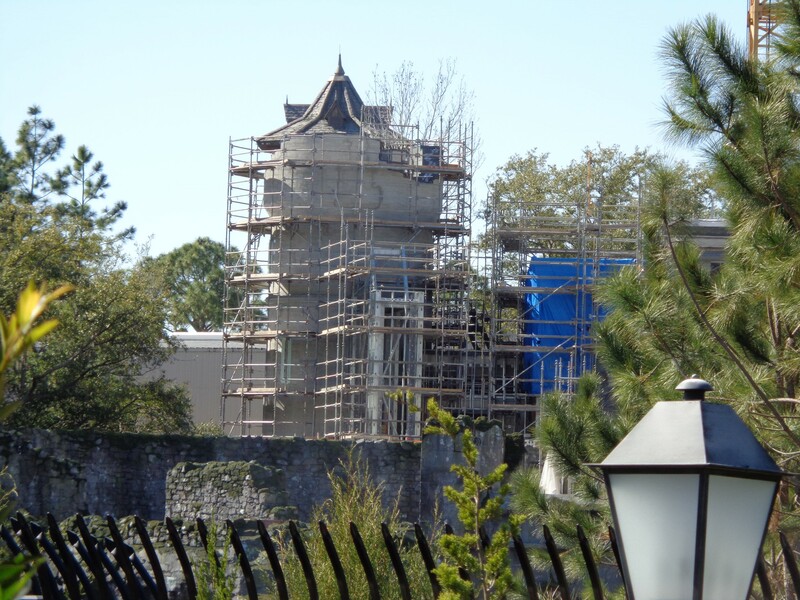 A turret has been rethemed with new brickwork that better matches the Wizarding World style, and a new steel arch is being constructed. 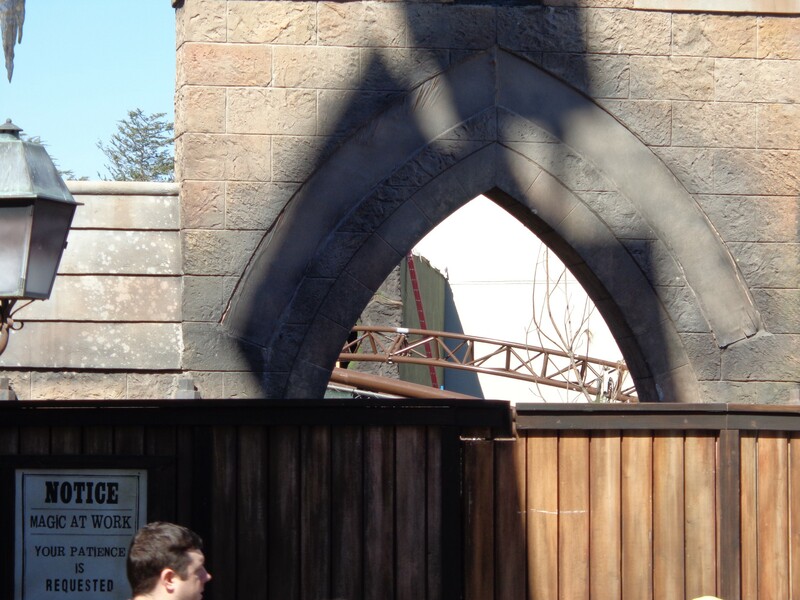 This arch entrance to the interior queue looks to me like the Gatehouse entrance, which would mean sections of the interior queue might place inside of Hogwarts Castle. What do you think? 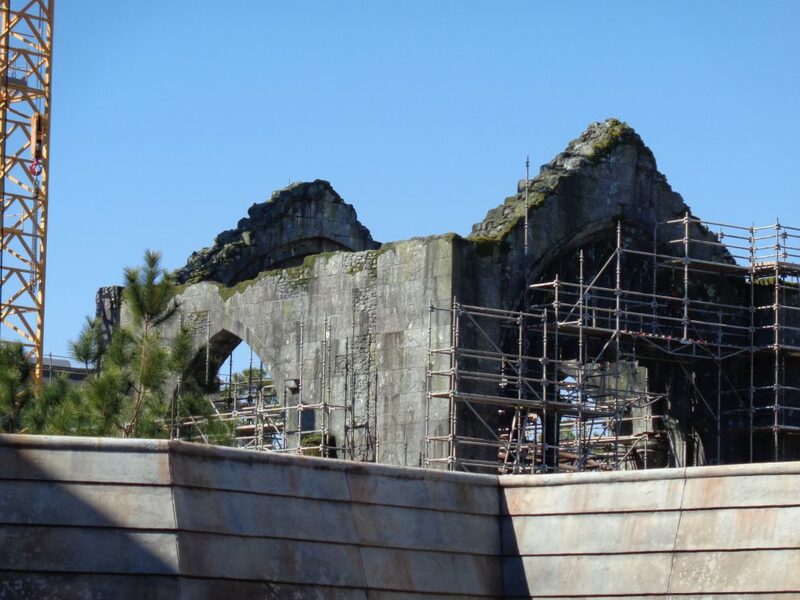 The ruins are looking pretty well themed at this point. 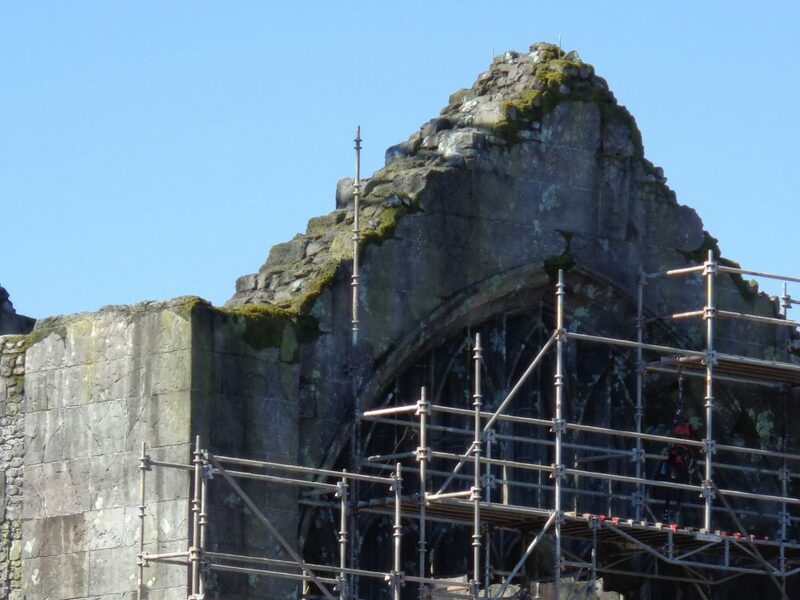 Lots of amazing brickwork, a broken stained-glass window type arch, and very realistic moss and lichen details have been added. 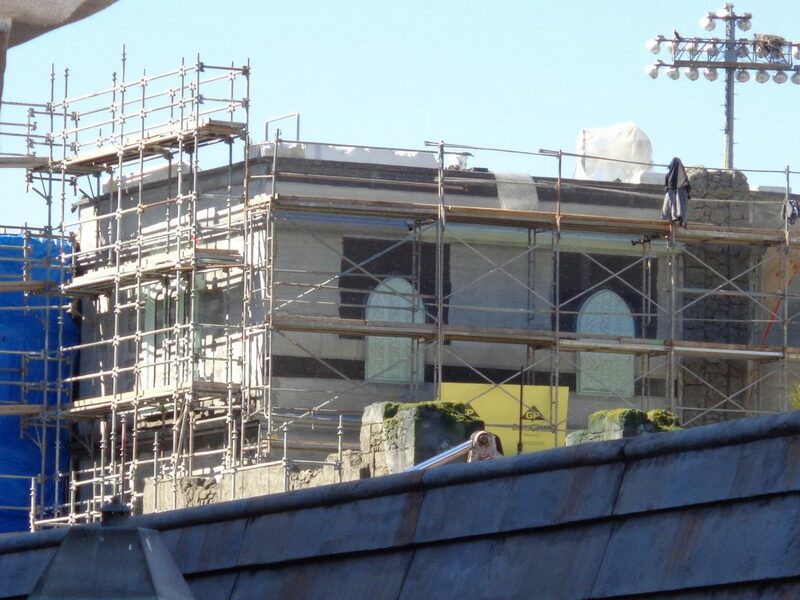 Even better news, a lot of the scaffolding is coming down. 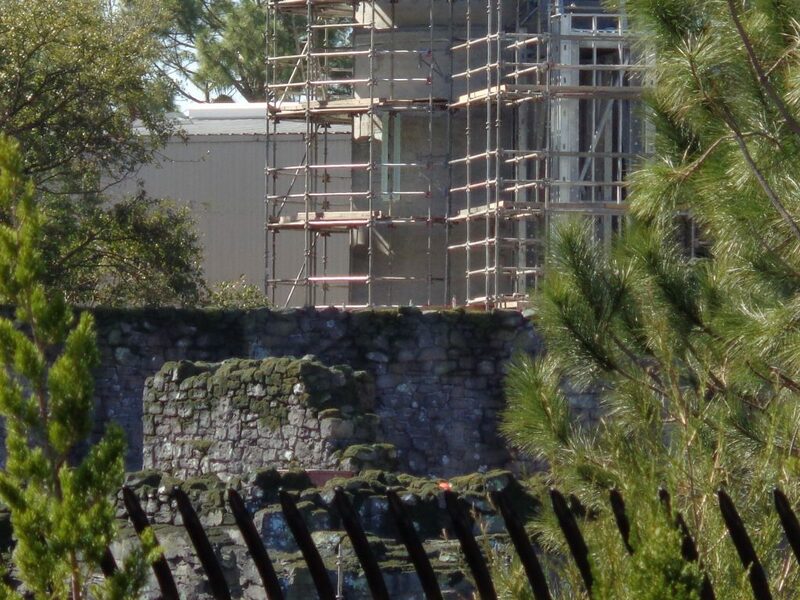 You can also see the ruins poking up over the former Dragon Challenge exit, behind Ollivanders. 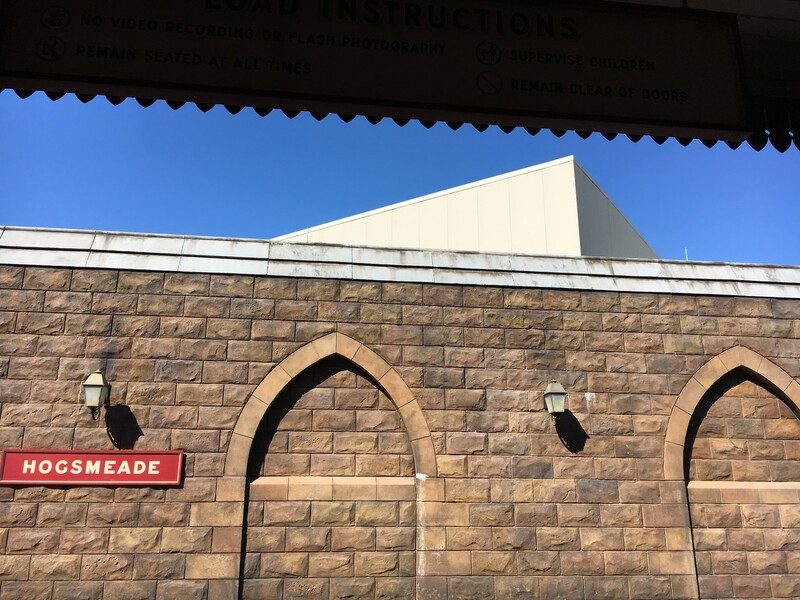 Now let’s head to the exterior queue for the Hogwarts Express. 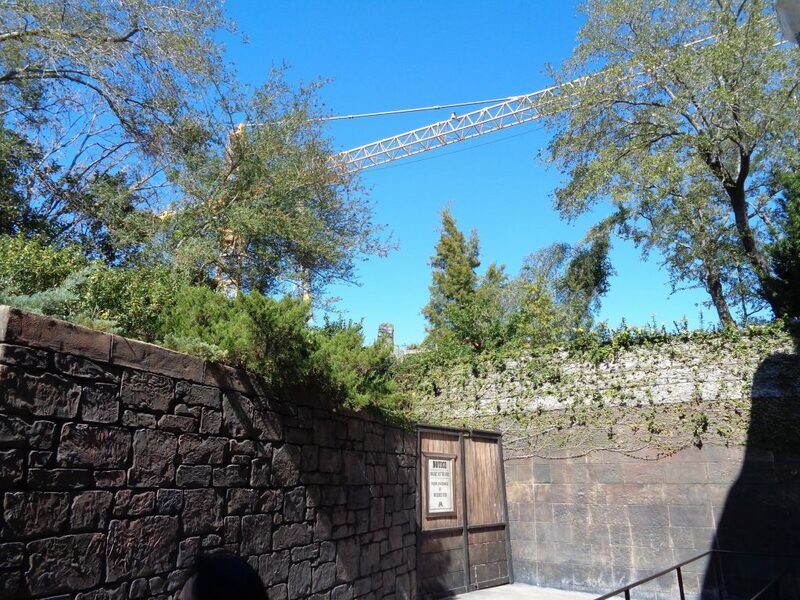 Here you can get some of the best views of the coaster. 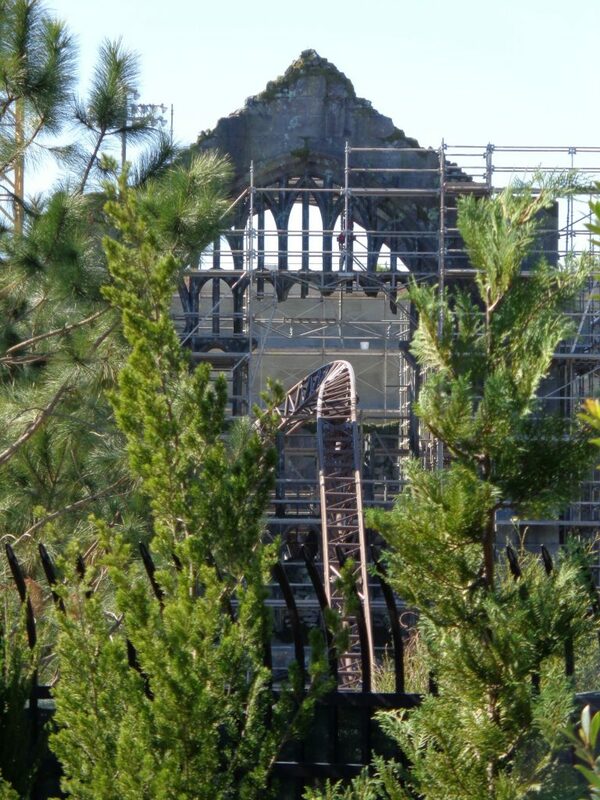 My favorite thing to take photos of is that track being launched right through the center of the ruins. 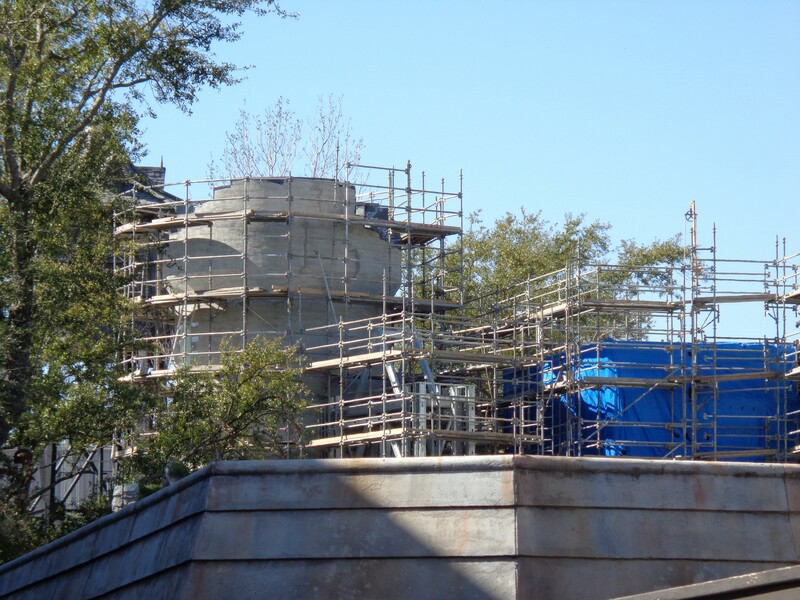 We can also see more of the queue structure entrance work from here, and some of the aged brickwork on the ride below us. 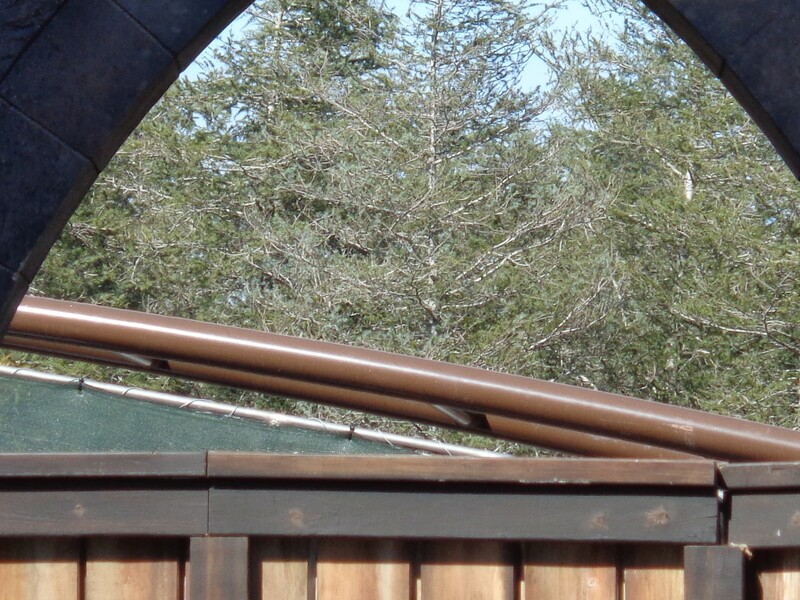 As promised, here’s a closer view of some of the details on that round structure for scene 5. 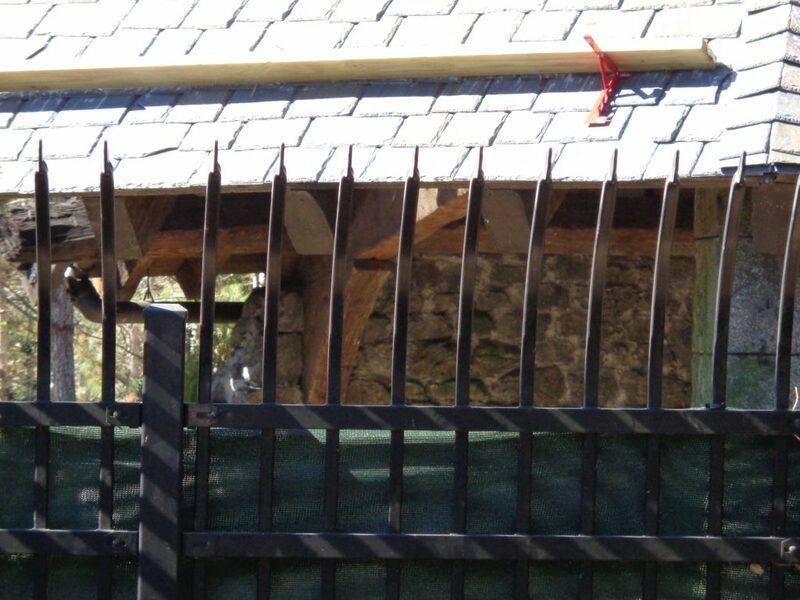 The stone walls look great and up close we can see the roof detail as well. We can even see into the interior of the structure from here, for now. One last look at the coaster as seen from the Hogwarts Express queue. Such a beautiful sight. That’s all for this update! Be sure to share this post with others and subscribe to the news feed to never miss an update. Let me know in the comments below what you think of the new coaster. How fantastic, sure do hope it’s open before my visit in June. Thanks for the continuous updates! 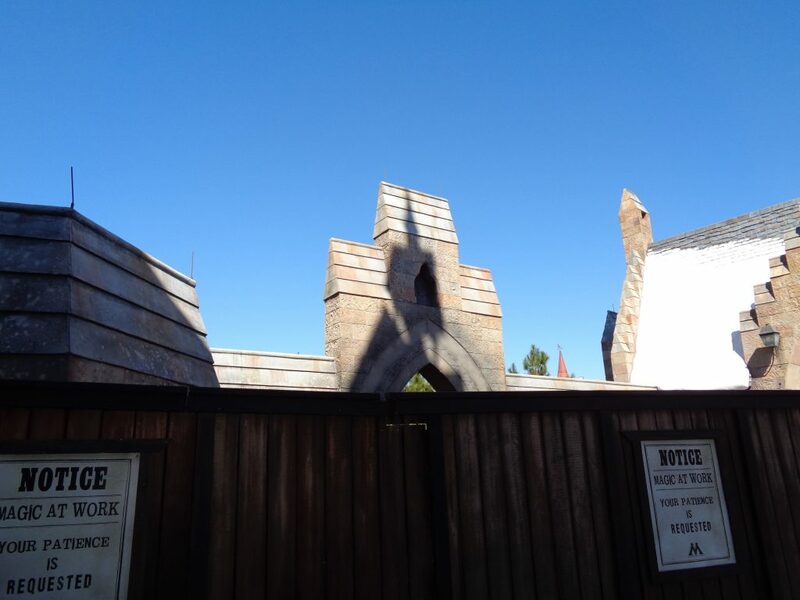 I’m wondering if the ruins are supposed to be how Hogwarts looks to Muggles. Sounds incredible. I go at end of October, so hoping it’s open then. Looking forward to this more than anything else opening this year.